Blogging is not much fun without an audience, but how can you get people to visit your new Tumblr blog? Many of us already use social networks like Facebook and Twitter, so here’s how you can integrate your Tumblr blog with other networks. Would you like all of your family and friends on Facebook to know all the witty things you post on Tumblr? 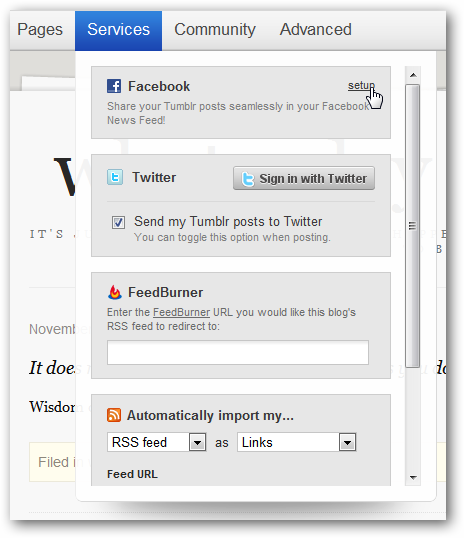 It can automatically post to your Facebook wall whenever you publish something on your Tumblr blog. 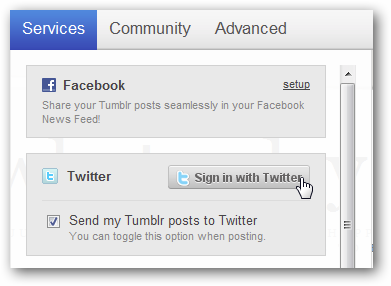 To activate this, go to your Customize page at tumblr.com/customize and select the Services tab. Click Setup in the Facebook box to start adding it to your Facebook account. Sign into your Facebook account if you’re not already signed in, and click the Allow button to grant accesses to the Tumblr application on your account. Enter your Tumblr blog’s address, and then click Start importing this blog. If you’re using the default free address, enter your_blog’s_name.tumblr.com; alternately, if you’re using your own custom domain, enter your domain as normal. 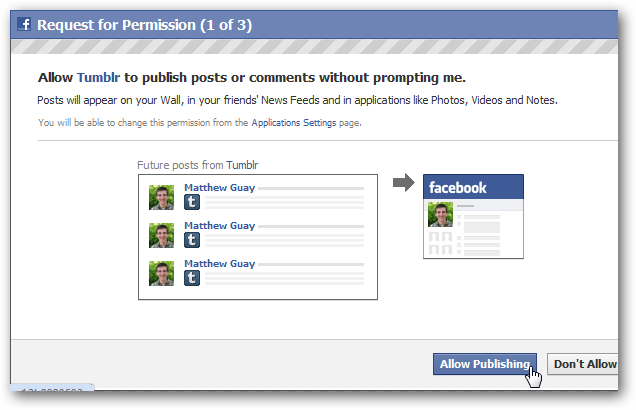 Click Allow Publishing to approve Tumblr posting on your Facebook wall. 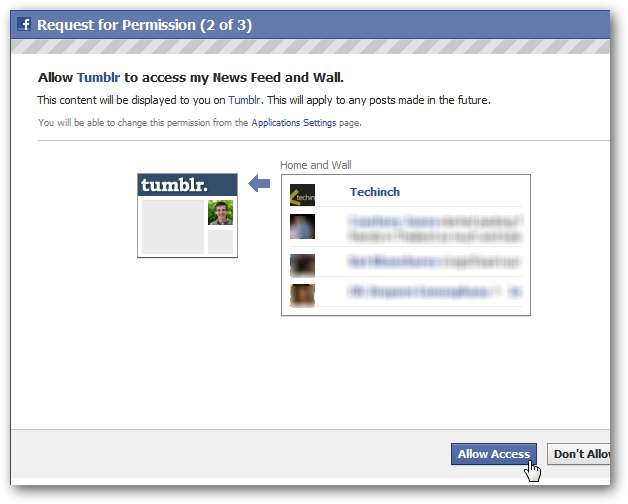 Tumblr will ask to access your news feed and wall also; click Allow Access so it can use Facebook services directly in your Tumblr dashboard. Finally, click Allow to let the Tumblr Facebook app remember you so you won’t have to re-approve it every time. 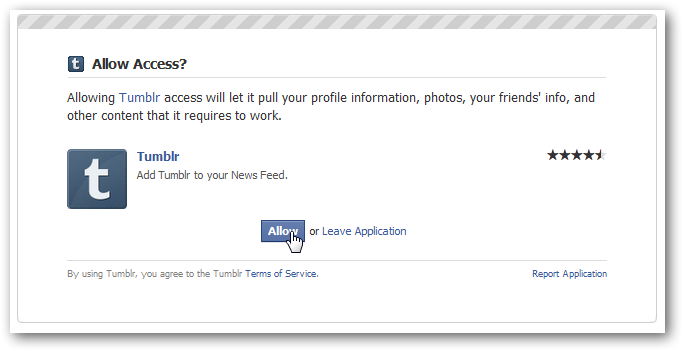 Once you’re done, you’ll be informed that your Tumblr posts will automatically be imported to Facebook. If you need to change one of the configurations, click Disable and reconfigure; otherwise, you’re good to go! Now, whenever you post something on Tumblr, it’ll be posted on your Facebook wall also for all of your friends to see. Short posts such as link and quote posts usually show the entire post on Facebook, but longer posts will only show the title and opening sentences, and then you’ll have to click View post to see the rest. The update will change depending on your post style. Here we’ve posted an mp3 on Tumblr, and it showed up with a play button on Facebook. The “button” is actually just a link to our Tumblr post, so your friends will still have to head over to your Tumblr blog to listen to audio or view other multimedia content you may post. Unfortunately, Tumblr cannot automatically post to fan pages; it can only post to your personal wall. If you’re using Tumblr for a company or publicity blog and want to put your posts on your Fan page, you’ll need to post them manually or use an alternative service such as twitterfeed which can also post to Facebook. While Facebook is great for communicating with family and friends, you might want to spread your posts to a bit broader audience. Twitter’s openness makes it a great way for others to discover your posts, and we increasingly find Twitter our social network of choice. Tumblr works great with Twitter; to add it to your Tumblr, open the Customize page and select Services as above. 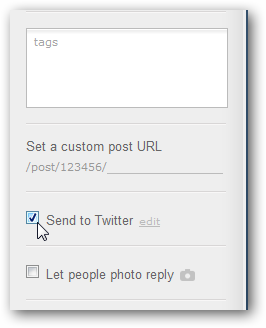 This time, check the Send my Tumblr posts to Twitter box and click the Sign in with Twitter button. 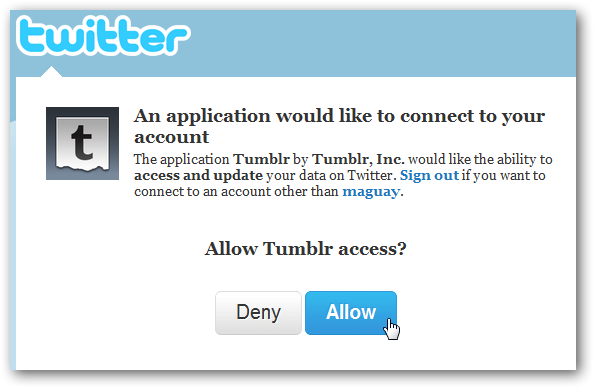 Sign in to you Twitter account if you’re not already, and then click Allow to add the Tumblr application to your Twitter account. Now Tumblr will automatically post a tweet whenever you publish a new post. Here’s how one of our articles showed up on Twitter. 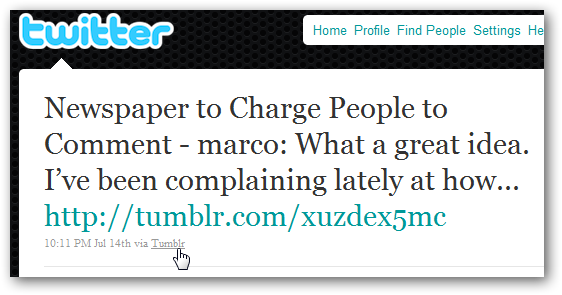 Note that it says it was tweeted from Tumblr, and also uses a special Tumblr.com short URL. Sometimes you might like to write something on Tumblr but not share it on Twitter. If so, just uncheck the Send to Twitter box when composing a new post. 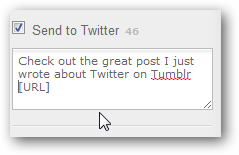 Or, if you’d rather just change Tumblr tweets when your post goes live, click the Edit link and add your own text. Leave the [URL] in, as this will be replaced with the link to your post. 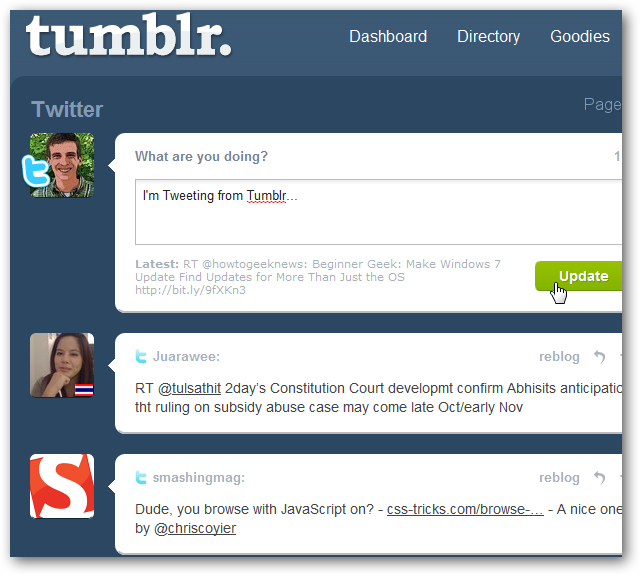 Once you’ve added a Twitter account to Tumblr as above, you can integrate Twitter with Tumblr very nicely. From your Preferences page at tumblr.com/preferences, you can select to show Twitter updates in your main dashboard feed. Do note that if you follow many people on Twitter, it may be hard to keep up with on the Dashboard. Or, you can just access your twitter feed from the drop-down menu on your Dashboard. 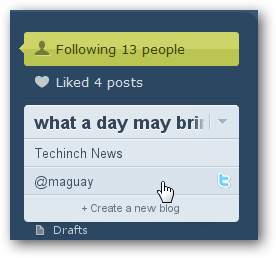 Click the arrow beside your blog’s name, and then select your Twitter name. Now you can view use Tumblr as a Twitter app. You can view and post tweets, or even reblog a tweet on your Tumblr blog. Although social networks have taken the place of blogs for many people, Tumblr makes it easy to bring the best of both worlds together. This is a great way to post a picture, quote, or more, and immediately share it with your Tumblr and Twitter followers and Facebook friends in one click. We especially liked the way we could customize the Twitter post, and wish you could customize what was posted on Facebook the same way. If you need to share your Tumblr posts with more friends, you can often use your Tumblr’s RSS feed to post to other networks such as Google Buzz. Let us know what networks you share your Tumblr posts on, or if the Tumblr ecosystem has replaced other social networks for you!